Where do I use my PartySwan voucher code? If you’re looking for party and event decorations, or personal gift ideas that your loved ones can cherish forever then look no further than PartySwan. PartySwan specialises in boards - a new trend that everyone seems to be enjoying - and stock a huge array of portrait and landscape boards that are available for personalisation. Choose from photo boards, selfie boards and event boards and upload your photos and edit text to make them your own. Choose a template that you like the most and add your own personal touches to the design to ensure it’s exactly what you want. You can also tailor make your boards for the specific occasion you’re shopping for. Discover and create boards for a variety of different occasions such as birthdays, weddings, christenings and baby showers and greet your guests with a beautifully decorated board that’s entirely your own. As well as birthdays, engagements, weddings, anniversaries, christenings and baby showers PartySwan also provide boards for a whole host of other events and occasions including graduations, congratulation parties, father’s day, mother’s day, funerals, leavings doos and gender reveal parties. They also provide boards for home decor-allowing you to create a photo collage full of all your favourite family pics that you can then hang proudly in your house. PartySwan provides hundreds of board templates for birthday parties and events. 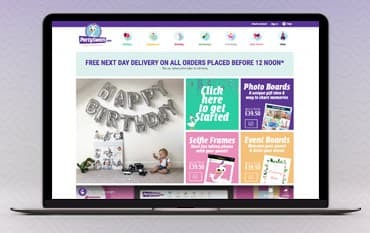 Whether you’re looking to create something for your own birthday or you’re looking for something special to gift someone with, you can find the perfect options at PartySwan. Browse through boards that allow you to add photos and text and discover simple, traditional, themed, colourful and novelty boards for all ages and tastes. Discover special boards for 16th, 18th, 21st and 40th birthdays, as well as many other big birthdays, and browse through boards for kids that incorporate unicorn, flamingo, pirate, jungle, Alice in Wonderland and comic themes. In the birthday section, you can also find the popular Instagram boards that can include your own birthday hashtag and photo, as well as the cut-out boards that allow you and your guests to create your own real-life Instagram posts during your party celebrations. Gender reveal parties are becoming more and more popular each year and provide excellent opportunities to make memories with family and friends. Celebrate this special time in your life with everyone you love and make sure you capture the day with the party boards available at PartySwan. Discover a variety of different styled boards including traditional, pink and blue, floral, stripped and simple boards with different text and picture options. And remember to use a discount code from NetVoucherCodes to save money on your gender reveal board. PartySwan is a brand new company that is aiming to change the way you share your memories with innovative party products that can be personalised for any occasion. With a unique party, selfie and event boards for birthdays, engagements, weddings, anniversaries, christenings, baby showers and much more you can ensure your party venue or special event is decorated in style with personal touches that’ll mean that so much more. Create your ideal board online using the templates provided and add a PartySwan discount code from us to your basket for incredible savings on your purchase.